This entry is part 2 of 3 in the series City Trip - Munich. 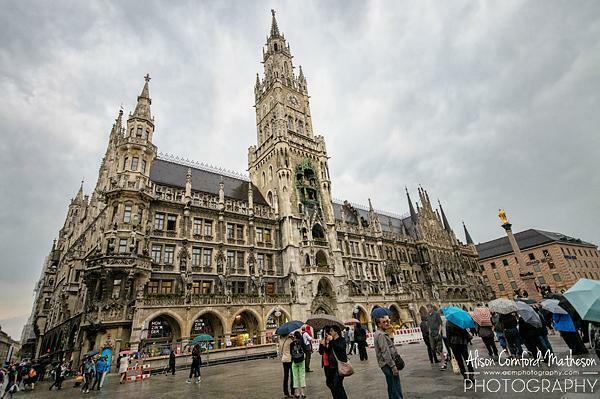 Recently, I had the opportunity to visit Munich, a German city I knew little about. The theme of my visit was ‘Tradition and Design,’ and while Munich’s abundance of modern design surprised me, so did the richness and diversity of its tradition. Munich is the capital of Bavaria, and I was intrigued to see it differs from Berlin in just about every aspect. 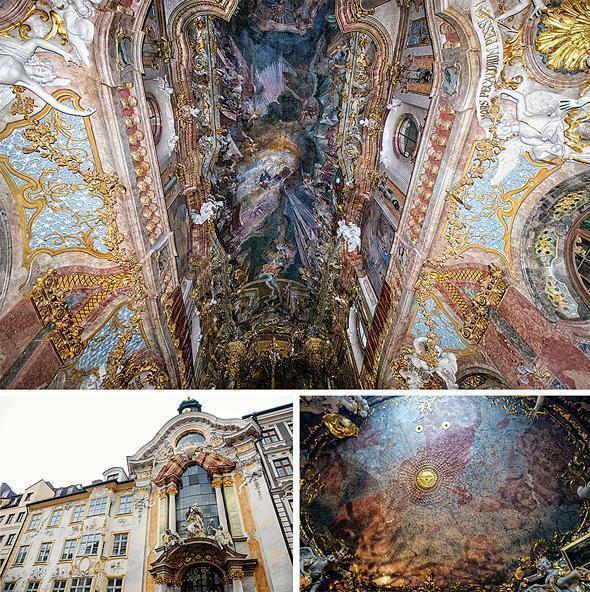 While both cities have a flair for art and design (something I love), Munich’s artistic roots seem to reach deeper than Berlin’s contemporary edginess. 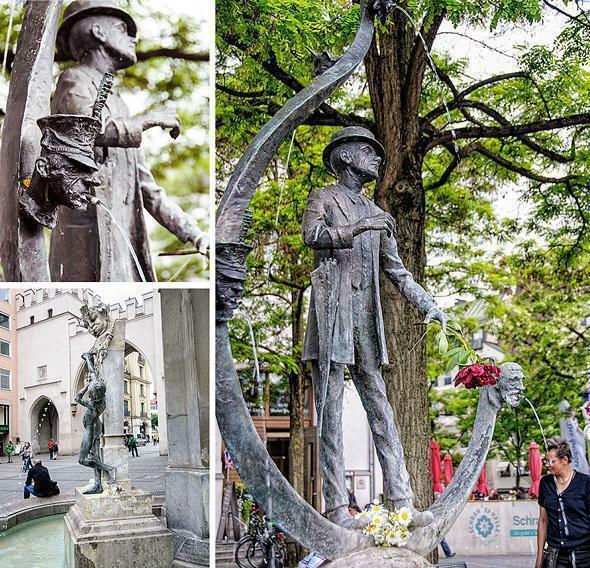 Signs of Munich’s artistic tradition are visible throughout the city. Of course, you can experience traditional food, culture, and architecture in places like the Hofbrauhaus, mentioned in my previous article on Munich’s top foodie destinations. 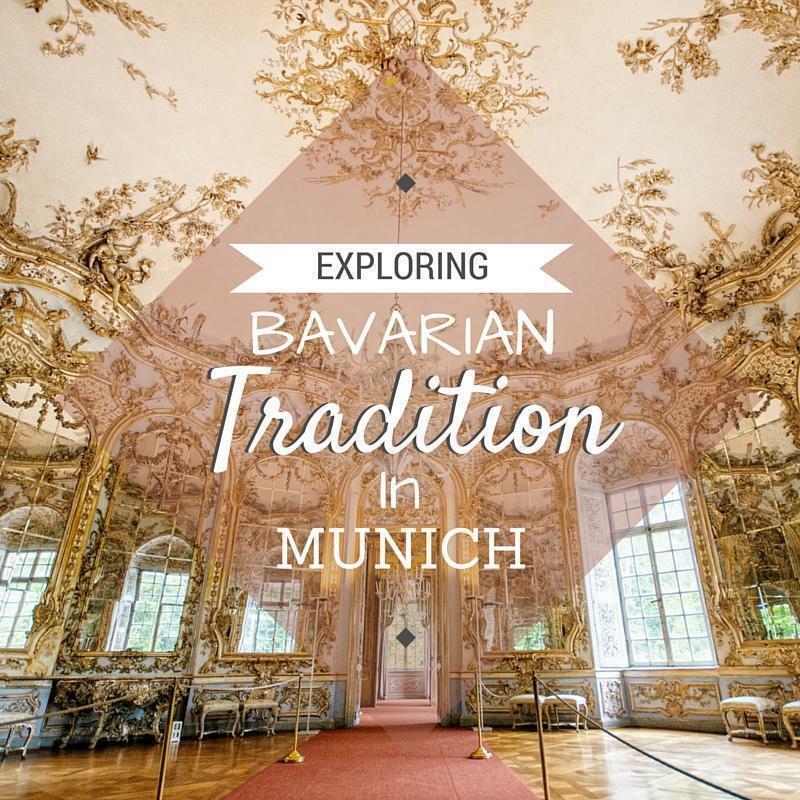 However, Munich’s traditions run deeper than its beirgartens and Oktoberfest. 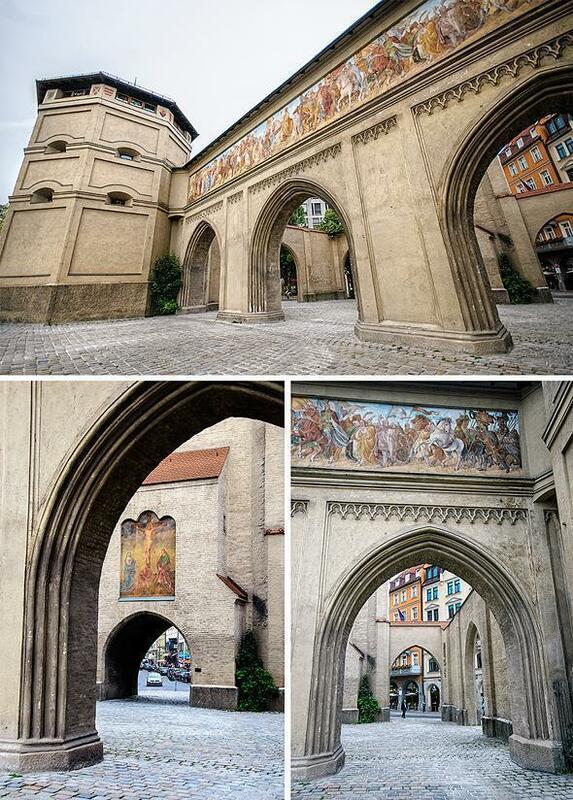 Throughout Munich’s Old Town, you can see signs of the city’s medieval past. 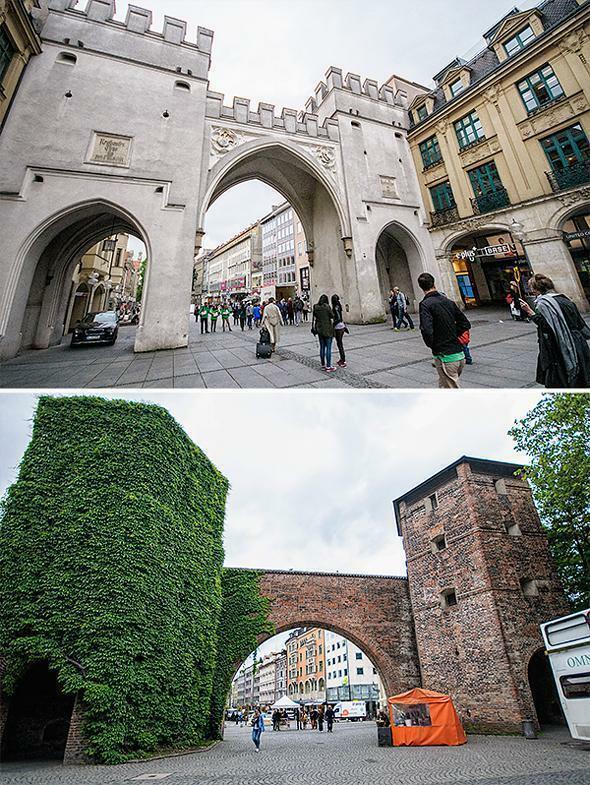 Three of the four former city gates remain, as a testament to the walls that once surrounded Munich. The most striking of these is the Isartor, constructed in 1337, with its beautiful frescoes. The frescoes date from 1835 and depict Emperor Louis, returning victorious, after the Battle of Mühldorf in 1322. The lovely Isartor with its colourful fresco. The other two gothic gates are Karlstor, in the west, and Sendlinger Tor, to the south. As the 43 bells chime, 32 life-sized figures begin to move. Mechanical knights joust and crowds dance, as Duke Wilhelm V, founder of the Hofbräuhaus, marries Renata of Lorraine. The dancing figures perform the Schäfflertanz, or coopers’ dance, which, according to tradition, was performed to help ward off the plague. The coopers remained loyal to the Duke, and their dance came to symbolise loyalty during difficult times. You can still see the Schäfflertanz, every seven years, at Munich’s Fasching, or carnival. The next one will be held in 2019. Despite Munich’s landlocked location, water plays an integral role in the city’s history. Munich was built along the River Isar, which, these days, contributes to the city’s hydroelectric power supply. 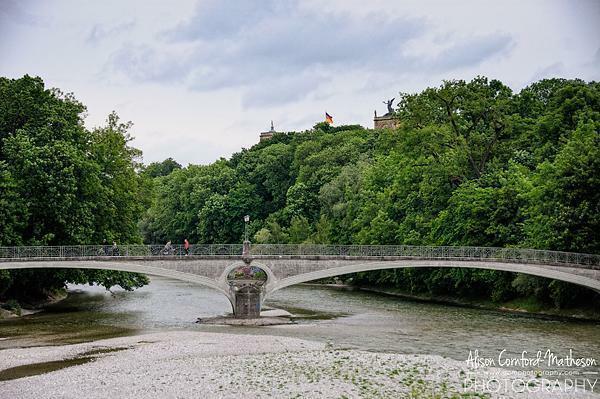 During medieval times, the Isar’s water supply was Munich’s lifeblood. Remnants of water’s importance can be seen in Munich’s more than 180 public fountains, dotted throughout the centre. About 75 of them still provide clean drinking water. They range from simple stone basins to elaborate statues, and many of them are popular meeting spots. Of course, water is necessary for more than drinking. 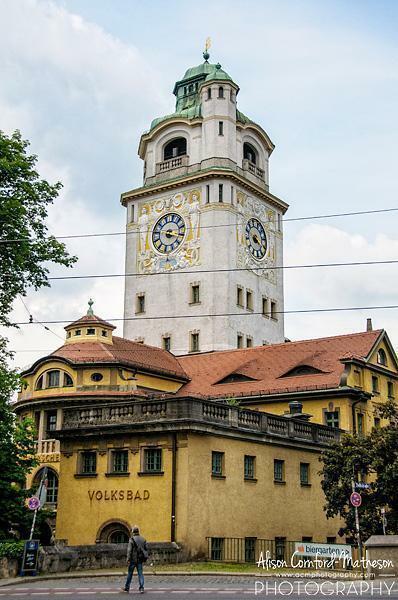 Münchners understood the relaxing and healing properties of water and, in 1901, opened the doors of the city’s first public swimming and bathing area, the Müller’sche Volksbad. This beautiful Art Nouveau building is still a popular spot to swim and relax in the saunas and steam bath. Sadly, I didn’t have enough time to visit for myself, but it’s on my Munich bucket list for my next visit. 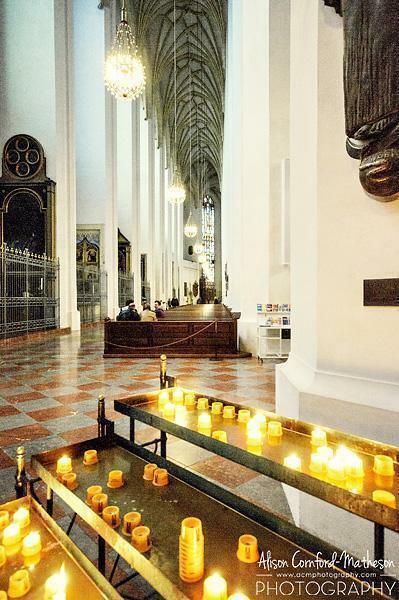 In every traditional society, art and religion go hand in hand, and Munich is no exception. Dotted around the city are a variety of churches of all sizes and architectural styles. 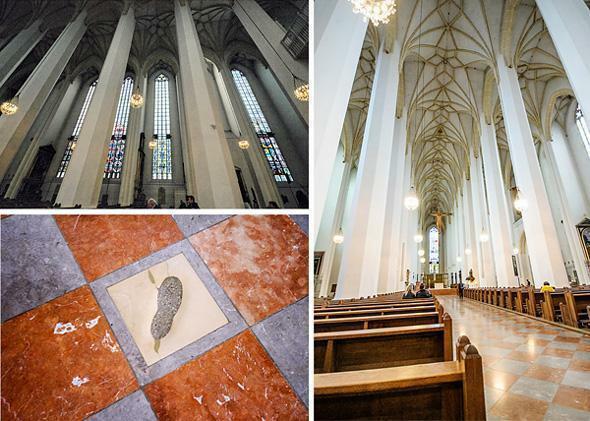 Two of the most interesting are the gothic Frauenkirche, one of the main symbols of Munich, and the rather hidden away Asamkirche, a tiny baroque gem. The two churches could not be more different. The twin towers of the Frauenkirche, or Dom zu Unserer Lieben Frau (Cathedral of Our Dear Lady), dominate Munich’s skyline. This is in part due to a city by-law prohibiting construction over 99m, the height of the towers, in the city centre. Despite its gothic heritage, the church is relatively plain and stately. It was heavily damaged during WWII, but one unique feature remained – the Teufelstritt or Devil’s footprint. The footprint is just inside the main door of the church. Legend has it the devil entered the church, and due to its peculiar architecture, couldn’t tell it was a holy building. It’s true; from this vantage point, the columns block the stained glass windows. When the devil realised he had been tricked into the church, he stomped his foot, leaving his mark on the floor. Contrasting the understated elegance of the Frauenkirche is the Asamkirche. 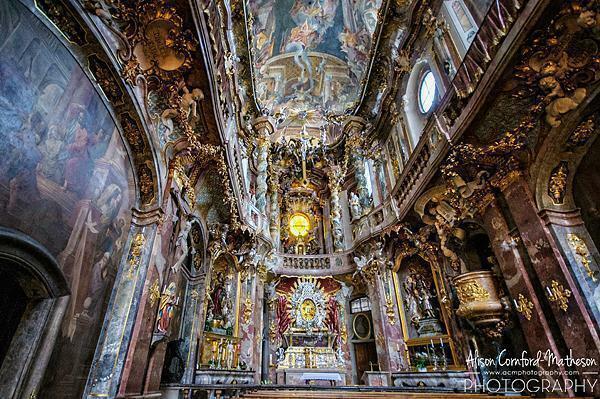 Also known as St. Johann Nepomuk, this tiny chapel is over-the-top baroque. The brothers Asam built it in the 1730s, as their private church, although they were later forced to open it to the public. One of the brothers, Egid, even had a window installed so he could see the altar from his private residence. The church is only 22x8m, but it seems much larger. The artisans employed trompe l’oeil techniques to make the flat ceiling seem curved and spacious. Paint, gilding, or carvings (sometimes all three) decorate every inch of space. 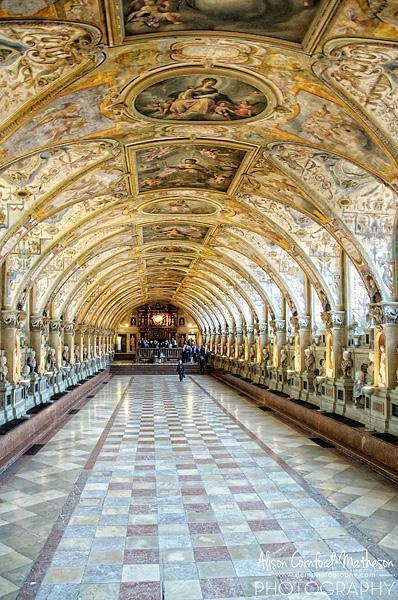 Of course, churches aren’t the only place to see Munich’s ornate traditional architecture. 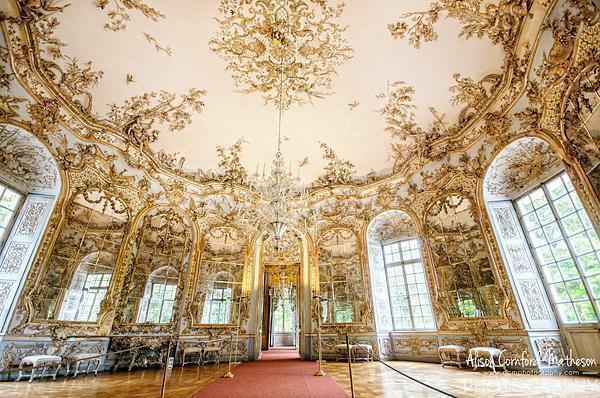 The Bavarian nobility maintained several residences dotted around the area, each more ornate than the next. 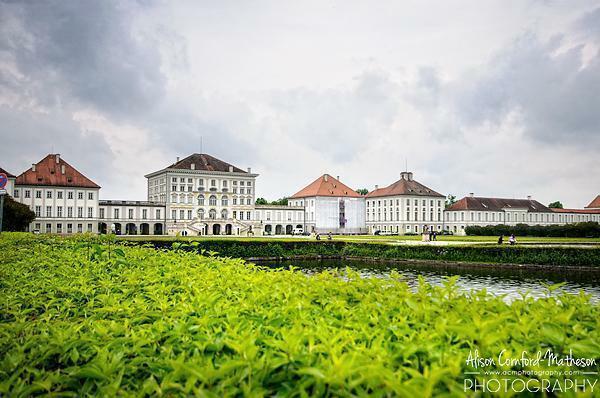 One of the grandest castles in Munich is Schloss Nymphenburg or ‘the nymph’s castle’. This vast estate was the summer residence of the Bavarian House of Wittelsbach. It is in fact so large; you can spend the better part of a day visiting the castle and its museums and grounds. Given our limited time, we didn’t have the opportunity to wander through the palace itself. We did, however, visit one of the pavilions in the 180ha palace park. 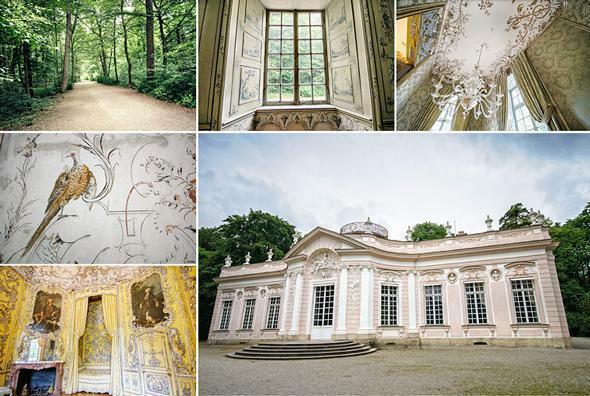 Amalienburg is one of four pavilions hidden around the grounds and was the hunting lodge of Maria Amalia of Austria, the wife of Charles VII. This little pink lodge is a wedding cake of Rococo decoration. 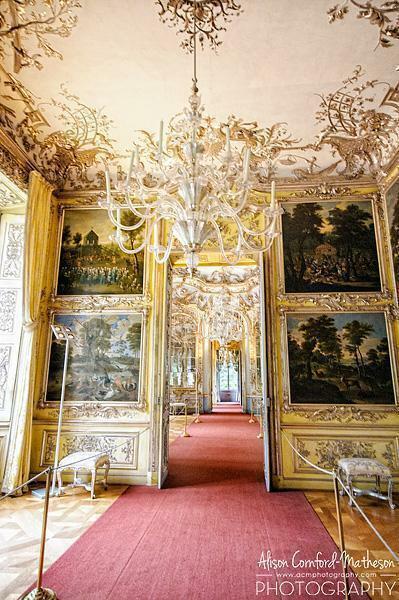 It even has a mini Versailles-esque Hall of Mirrors. 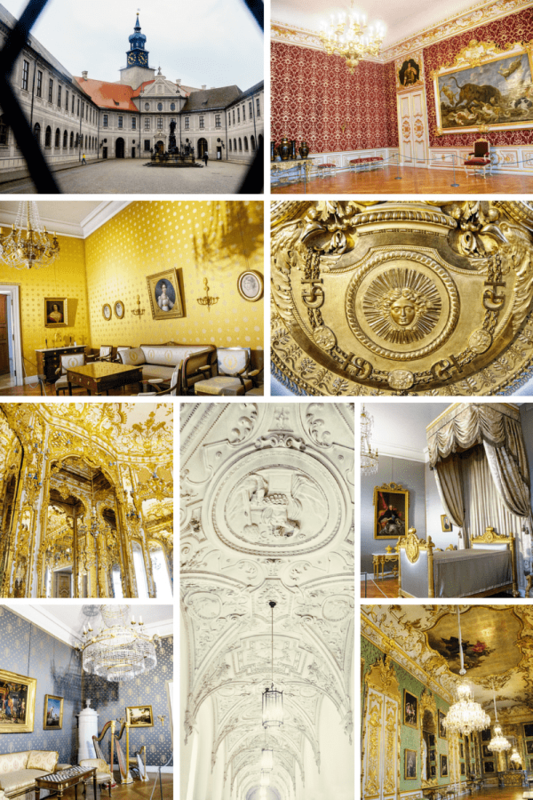 My two favourite rooms in Amalienburg are slightly more understated. 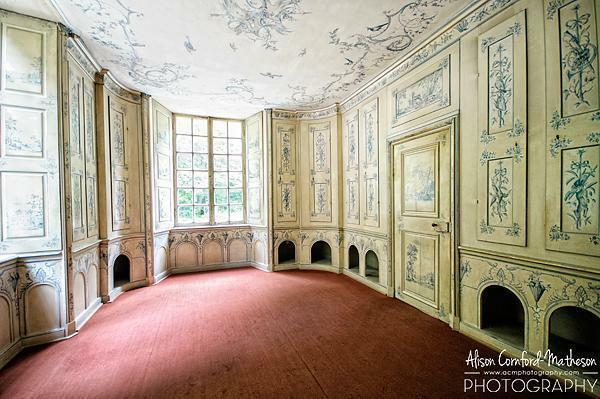 First, there is the kennel for the hunting dogs. I loved the little cubbies in the walls for the hunting dogs. 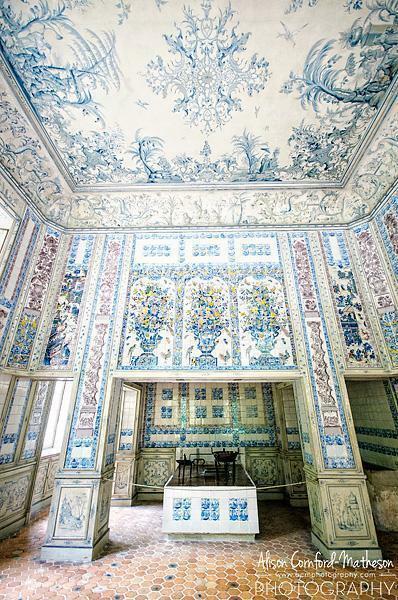 And of course, I was drawn to the beautiful blue and white kitchen with its Delft tiles. I just can’t resist a Delft-tiled kitchen! A day exploring the entire Nymphenburg castle complex is also on my return to Munich bucket list! The second palace I visited in Munich, I was able to explore more fully (although still at a run, as we were the last group to sneak in before closing time). 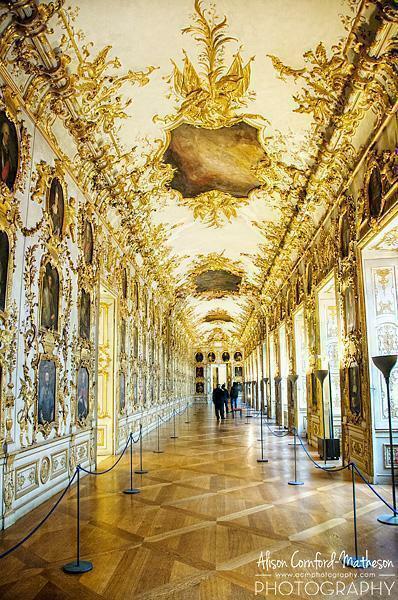 The Residenz Palace was the Wittelsbach’s residence in Munich’s centre, since the 14th century. The castle was expanded and extended, over the centuries, arriving at its current state in the early 19th century. Again, it would be easy to spend an entire day exploring the 130 rooms. 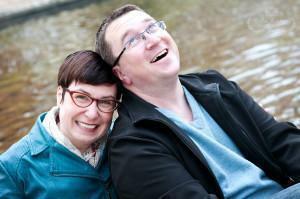 The highlights are a mish-mash of styles, due to the constant expansion over time. 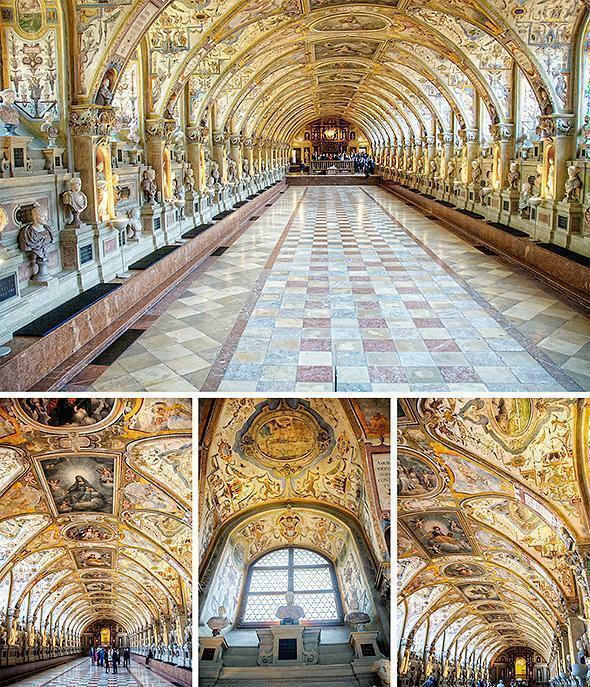 The most striking room is the vast Antiquarium, with its colourful frescos and 300 busts lining the windows. 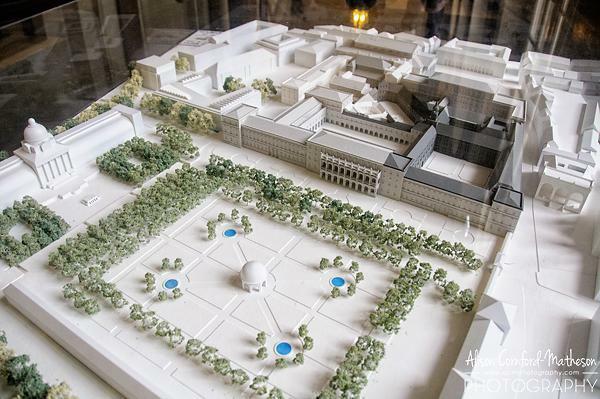 Of course, like the rest of Germany (and, let’s face it, the world as a whole), not all of Munich’s history is pretty. However, I was surprised to learn of a tradition of resistance, which culminated in the White Rose (Weiße Rose) movement in WWII. This non-violent group, consisting of university students and their philosophy professor, embarked on a leafleting campaign to urge Münchners to resist Hitler and the Nazis. The six leaders were arrested and beheaded by the Gestapo; a particularly shocking and brutal sentence, in an already brutal regime. 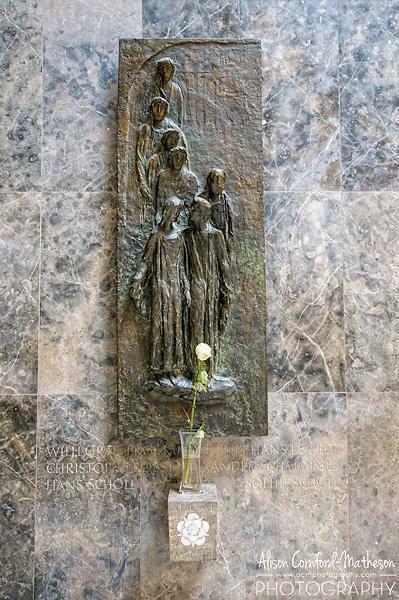 The White Rose leaders are commemorated by the university in a small museum about the movement and several art pieces around the campus. 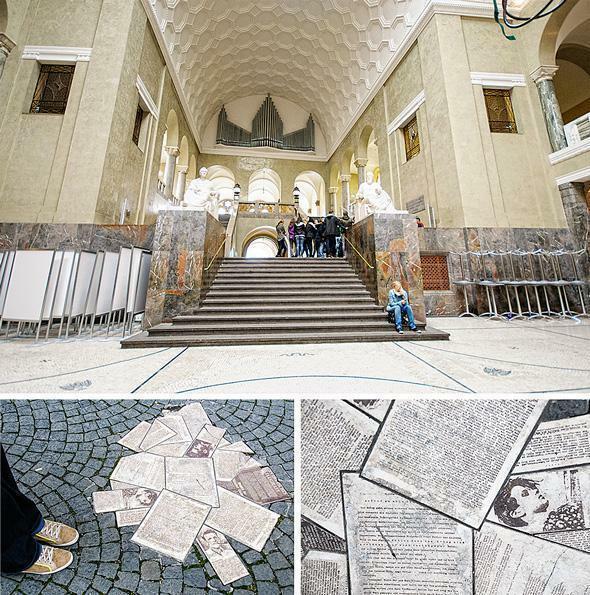 In the main entranceway, there is a sculpture dedicated to Sophie Scholl. Sophie is particularly revered for her bravery. As the only woman, she had the opportunity at her ‘trial’ to blame her brother for her participation. She refused, claiming full responsibility for her own actions and was beheaded along with the male resistance members. Despite the murders of the leaders of the movement, the White Rose had the final word. The movement’s final leaflet was smuggled to the Allies who printed and air-dropped millions of copies over Germany. 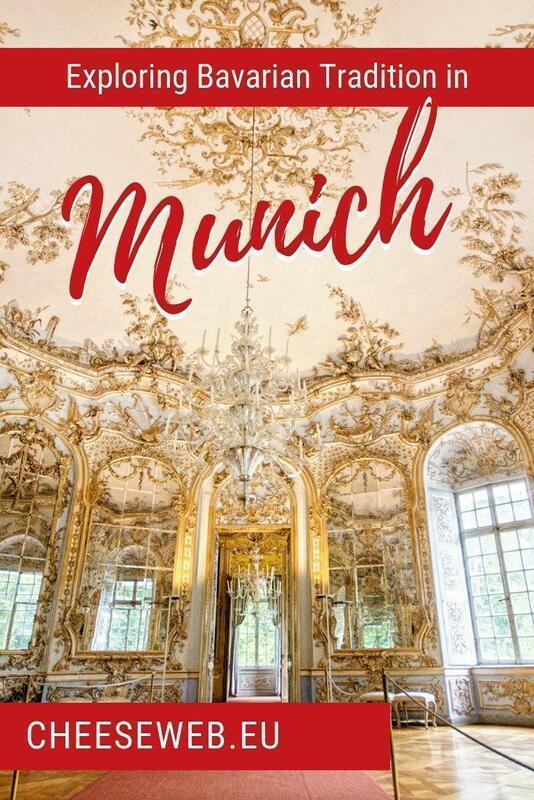 While Munich’s roots in tradition run deep, it doesn’t mean the city is stuck in the past. On the contrary, I was surprised by the abundance of modern design, in food, architecture, fashion and more, throughout the city. In next week’s final article about Munich, I’ll share some of my favourite design discoveries in Munich so stay tuned! I wouldn’t be able to do what I do without the generous support of our sponsors. 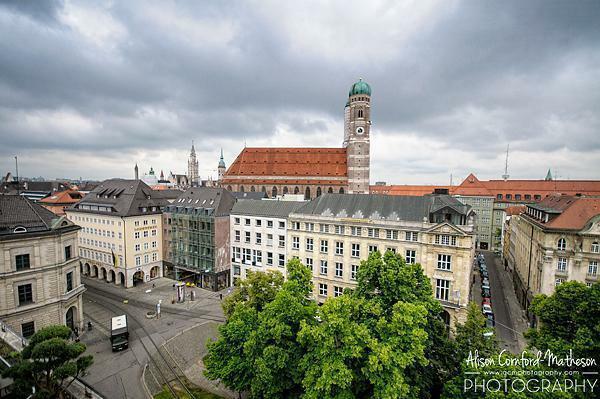 I’d like to extend a huge thank you to URBN PR and Munich Tourism for inviting me to discover their city. I’d also like to thank both Lufthansa and DB Bahn for sponsoring my travel to and from Munich. We at CheeseWeb are committed to always sharing our honest opinion of any product or service we write about, whether sponsored or not.